OpenStack is one of the most popular open source cloud computing projects to provide Infrastructure as a Service solution. 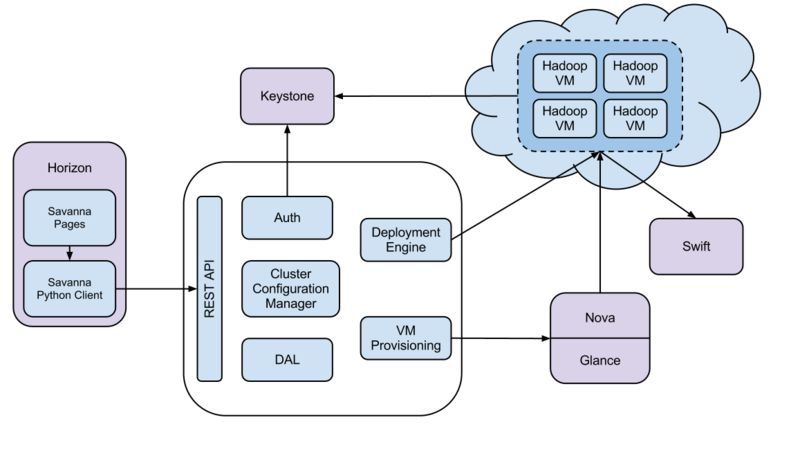 Its key core components are Compute (Nova), Networking (Neutron, formerly known as Quantum), Storage (object and block storage, Swift and Cinder, respectively), Openstack Dashboard (Horizon), Identity Service (Keystone) and Image Servie (Glance). There are other official incubated projects like Metering (Celiometer) and Orchestration and Service Definition (Heat). Savanna is a Hadoop as a Service for OpenStack introduced by Mirantis. It is still in an early phase (v.02 has been released in Summer, 2013) and according to its roadmap version 1.0 is targeted for official OpenStack incubation. In principle, Heat also could be used for Hadoop cluster provisioning but Savanna is especially tuned for providing Hadoop specific API functionality while Heat is meant to be used for generic purpose . Savanna is integrated with the core OpenStack components such as Keystone, Nova, Glance, Swift and Horizon. It has a REST API that supports the Hadoop cluster provisioning steps. Savanna API is implemented as a WSGI server that, by default, listens to port 8386. In addition, Savanna can also be integrated with Horizon, the OpenStack Dashboard to create a Hadoop cluster from the management console. Savanna also comes with a Vanilla plugin that deploys a Hadoop cluster image. The standard out-of-the-box Vanilla plugin supports Hadoop 1.1.2 version. # keystone is now configured by default to use PKI as the token format which produces huge tokens. # set UUID as keystone token format which is much shorter and easier to work with. # Change the FLOATING_RANGE to whatever IPs VM is working in. # In NAT mode it is subnet VMWare Fusion provides, in bridged mode it is your local network. In order to create nodegroup templates, to create cluster template and to create the cluster itself we have used a command line tool – httpie – to send REST API calls. The same functionality is also availabe via Horizon, the standard OpenStack dashboard.